If your family is anything like mine, you probably get asked what seems like a hundred times day: “Mom, what’s for dinner?” I used to have a small chalkboard on my fridge where I wrote what I was planning for dinner each night so I would not have to keep answering the same question over and over. 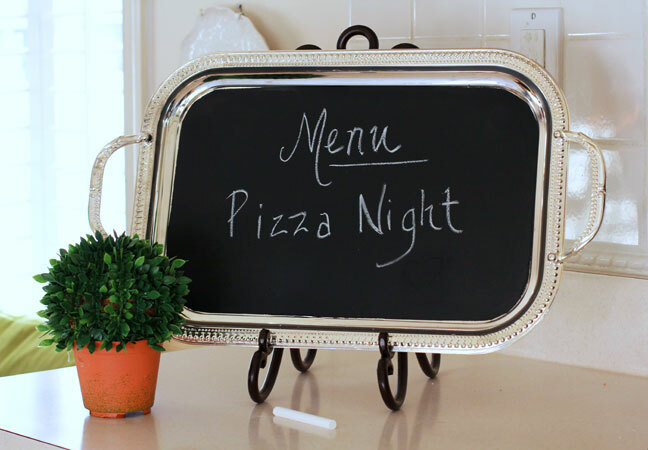 Recently, while out thrift store shopping, I found an inexpensive silver tray for $2.00 that I knew would be perfect to make a new kitchen menu chalkboard to replace the old one. 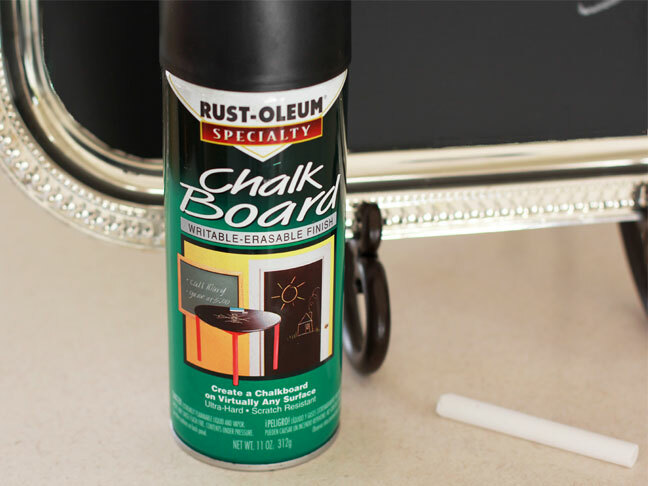 Depending on your style, you can create a chalkboard on any surface with chalkboard spray paint. A white ceramic platter or even a wood cutting board would work. You are only limited by your imagination. 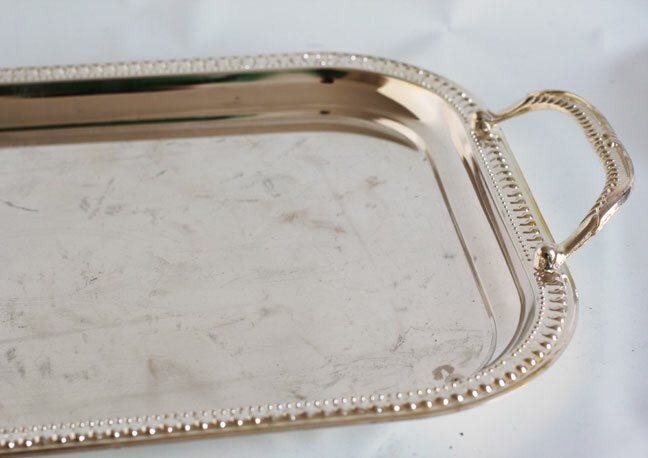 Step 1: Clean and dry tray. Step 2: Mask out area you don’t want to be painted with the chalkboard paint. 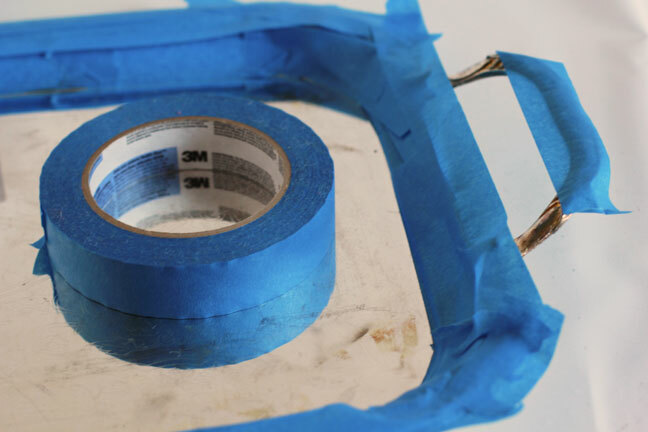 Make sure to smooth tape down well by running your fingers over all the edges of the tape. Step 3: Go outside or to a well ventilated area and spray one light coat of paint on tray. Make long and even sweeping motions to get a nice even finish. Let dry. Spray another coat on and let dry. Two coats should be enough, but check to see if you need more coverage before removing the tape. Carefully remove tape. Step 4: Place on a stand on your kitchen counter for all inquiring minds to see.